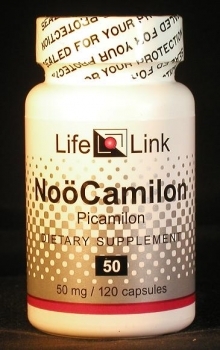 NoCamilon is LifeLink’s brand name for ‘picamilon’ — a notropic substance developed in Russia for improving a range of brain functions. Chemically, picamilon can be thought of as a fusion of the vitamin niacin and the neurotransmitter GABA. Accordingly, we will limit our discussion of NoöCamilon to a brief summary of relevant research, and let you draw your own conclusions about what medical conditions it may be effective in treating. It may seem surprising that a mere increase in blood flow would significantly improve brain function — surely something as sophisticated as mental activity would not be at the mercy of minor fluctuations in blood flow. But this does seem to be the case. In fact, one of the most effective tools for mapping brain function is functional MRI5 — the use of magnetic resonance imaging to pinpoint the locations of increased blood flow in the brain during the performance of selected mental tasks. Is NoöCamilon useful for the conditions and purposes mentioned above? We aren’t allowed to tell you, so you should take a look at some of the references cited here, and then decide for yourself.